Visiting the Barbara Hepworth Museum and Sculpture Garden offers a remarkable insight into the work and outlook of one of Britain’s most important twentieth century artists. Sculptures in bronze, stone and wood are on display in the museum and garden, along with paintings, drawings and archive material. Barbara Hepworth first came to live in Cornwall with her husband Ben Nicholson and their young family at the outbreak of war in 1939. 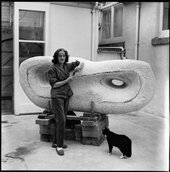 She lived and worked in Trewyn studios – now the Barbara Hepworth Museum – from 1949 until her death in 1975. Following her wish to establish her home and studio as a museum of her work, Trewyn Studio and much of the artist’s work remaining there was given to the nation and placed in the care of the Tate Gallery in 1980. 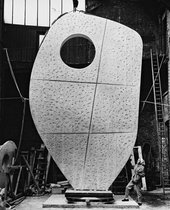 Finding Trewyn Studio was a sort of magic’, wrote Barbara Hepworth. ‘Here was a studio, a yard and garden where I could work in open air and space. Hepworth's work is also on show in the Modern Art and St Ives display at Tate St Ives. The gallery and museum are within walking distance of St Ives town centre and Porthmeor beach. There are daily National Express coach services from Victoria Coach Station, London. These services travel via Heathrow, Plymouth, Liskeard, St Austell, Truro, Redruth, Camborne, St Ives and Penzance – stopping at most small towns en route. There are regular local bus services to and from St Ives. St Ives is a 15–20 minute drive from the A30. On reaching the town, follow the brown signs to Tate St Ives. Please be aware that parking in St Ives is limited. A shuttle bus service runs throughout the year between the Trenwith Coach and Car Park and the town centre, which is a five minute walk from Tate St Ives. For details call St Ives Tourist Information on +44 (0)1736 796297. A train park and ride service operates from St Erth and Lelant Saltings stations between the end of May and the end of September. Visitors using the service receive £1 off Tate St Ives admission. The nearest airport is in Newquay, the regional commercial airport for Cornwall. Free entry for Tate Members, 18s and under. The Barbara Hepworth Museum and Sculpture Garden is closed on Mondays during winter months. There are steps and uneven surfaces at the Barbara Hepworth Museum and Sculpture Garden that make access difficult. For this reason wheelchair access is by prior appointment only. Call +44 (0)173 679 6226 or +44(0)173 679 1102. If you require a wheelchair, please let us know before you visit. Call +44 (0)173 679 6226 or +44 (0)173 679 1102. The Barbara Hepworth Museum and Sculpture Garden both welcome guide dogs and hearing dogs.